July 19, 2017. The Stewartsville Vol. Fire Co. takes one more step towards a new firehouse this week. As part of our preliminary site plan preparation the fire companies engineer needed geotechnical earth information for the site. This is needed to ensure the ground they will be building the new station on is secure and worthy of the investment. Fund raising is continuing at an aggressive level and all residence are urged to donate to move the project along. The next step which will hopefully take place in the colder weather will be to grade the ground for the driveway, building site and parking lots. Once that is completed construction of building will begin. That is not expected until sometime in 2018. As many of our followers know, on Tuesday March 1st 2016, the Stewartsville Vol. Fire Co. lost our 2007 Pierce 3000 Gallon Tanker in a fire at the DPW garage. In early October 2016 we took delivery of our new tanker. If you would like to follow along with the assembly of the new tanker, click the link below. Thank you for your support! • Protect your family and your property by having large visible house numbers. • Firefighters, police officers, and paramedics will be able to find you faster when your home is properly marked. • A visitor, child, or injured person may be unable to give clear directions and rely on your house being properly marked. • Emergency personnel from a neighboring community may be unfamiliar with your area. Put the numbers under lighting, and use numbers with a contrasting background so they will be visible at night. • Attach numbers to the home and NOT a door. Doors can be opened which will make the markings no longer visible. • If your driveway is long, also post your house number on BOTH sides of a mailbox or sign pole at the end of the driveway near the road. • Be sure to keep the numbers visible by trimming trees and bushes. • Use only equipment that is made for home heating. Use all types of heaters carefully and follow all directions for safe use. • Use a space heater that has been tested to the latest safety standards and has been certified by a nationally recognized laboratory. These heaters have the most up-to-date safety features. Older space heaters may not meet newer safety standards. • Place the heater on a level, hard, nonflammable surface, such as a ceramic tile floor. • Make sure space heaters are at least three feet away from bedding, drapes, furniture and other flammable materials. • Place smoke alarms on every level of your home, outside of sleeping areas and inside each bedroom. • Utilize a carbon monoxide detector. • Never leave a space heater on when you go to sleep. • Don’t place a space heater close to any sleeping person, bedding, furniture, drapes or other flammable materials. • Never use gasoline in a kerosene space heater, as even small amounts of gasoline mixed with kerosene can increase the risk of fire. • Never use your oven, grill or clothes dryer to heat your home. This could cause a fire or dangerous carbon monoxide gas, which produces deadly, odorless, colorless fumes. *Includes information from the U.S. Consumer Product Safety Commission. newer vehicle. Greenwich Township is financing a 2001 Pierce Dash 100’ Rear mount platform ladder with pump for $325K which is a fraction of the cost of a new ladder. --> Since the new ladder has a pump, we will retire our near antique 98-61 (1979 Ford/Pierce Class A Pumper). We took delivery of the ladder truck on Monday June 9, 2014. We now need to have the truck lettered as well as receive training on how to properly use all of its features. We hope to have the new ladder truck in service by July. Our other ladder truck is still for sale. Please contact the Chief or any member of the department if interested. An apparatus evaluation was conducted by Oeters Associates, Fire Apparatus Consulting Services, Inc. in December 2006. 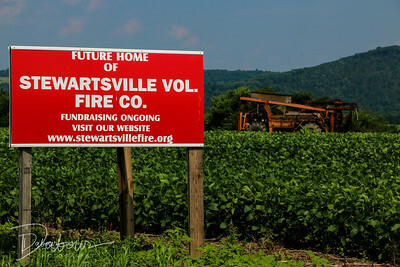 This report contains a number of changes that will have a positive effect on the health, safety and efficiency of the Stewartsville VOlunteer Fire Company. It also calls for the replacement of two (2) vehicles in the next couple of years.